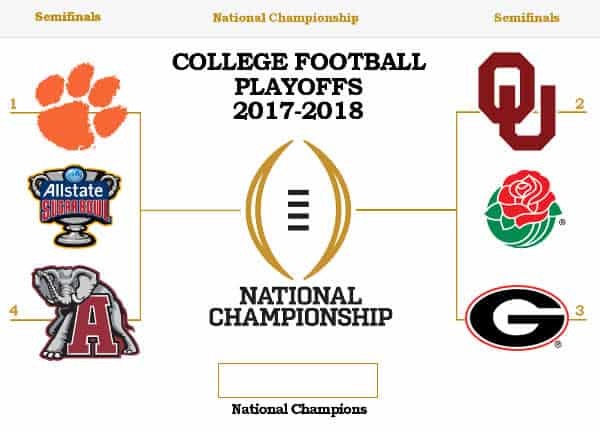 The College Football Playoff bracket is set as the regular season concluded with the conference championships over the weekend. There were some surprises in some of the games, and some upsets regarding the top 4 teams. This year’s semifinal will see the defending champions Clemson take on Alabama (a rematch of the last 2 championship games) and Oklahoma battle it out against Georgia. Let’s take a look on how these teams got to where they are. Oklahoma made quick work of TCU in the Big 12 Championship. QB Baker Mayfield locked up the Heisman award and helped his team clinch a berth in the Playoffs. They have been electric all season long, at least from an offensive standpoint, and will be tough to beat. If you look at their season stats, they look to be the biggest threat against Clemson, but now that Bama is back in the mix, things could get interesting. Oklahoma will be facing the SEC Champion, the University of Georgia Bulldogs. Georgia is coming off a revenge-win against Auburn. At #1 in the country earlier this season, the Bulldogs were projected to get into the CFP. However, Auburn blew them out to dethrone them. Auburn went on to knock out another #1 team in Alabama for the Iron Bowl. Many analysts expected Auburn to power through the SEC Championship and cement their spot in the postseason, but the Bulldogs came prepared and held the Tigers to only 7 points. Georgia leapfrogged Alabama while simultaneously knocking Auburn out of contention to land in the semifinals. They look good heading into the Rose Bowl. Clemson routed Miami in the ACC Championship and looked more like themselves. While Miami played well throughout the season, they were simply no match for Clemson. Their third straight ACC Championship locked them in at #1 heading into the Playoffs. An Ohio State victory in the Big Ten Championship threw analysts attempting to predict the #4 team into a frenzy. The Selection Committee ended up going with Alabama for the #4 spot, setting their date with the defending champs in the Sugar Bowl. Alabama will be coming off a loss against Auburn, but they are looking to redeem themselves after losing the championship to Clemson last year. A semifinal win against the Tigers would send a clear message to fans, analysts and the Rose Bowl winner that Alabama is deserving of their shot. The biggest upset from the weekend came from the Big Ten Championship between Wisconsin and Ohio State. Even though Wisconsin came in undefeated, the Buckeyes were projected to win. It was a relatively close game, but Ohio State came out on top. With that victory, Wisconsin lost its #4 spot. Ohio State believes they should’ve been in the semifinal, and so do many fans, but the Selection Committee picked Alabama over them based on their season resume. From a betting standpoint, Alabama would likely be favored over Ohio State anyway, so most feel that the Selection Committee got it right. Fans looking to wager on the 2017-2018 college football playoffs can find legal betting online options for both the Sugar Bowl and Rose Bowl. Bettors have some time to make their selections, as both games are not until New Year’s Day. This semifinal is shaping up to be one of, if not the most exciting since the CFP was introduced.